Nessus Review 2019: Is Nessus a Good Hosting? Nessus provides access to high-end server space as well as colocated Interxion or HP Proliant servers from data centers in Austria. Austrian-based Nessus specializes in offering rack space in one of their high-performance data centers in Vienna, Austria. Their core competence is in providing high-availability server space that is thoroughly monitored and managed. They started operations in 1999 making them one of the first providers in this space and now have a number of huge clients. Interxion hosting: Interxion is one of Europe’s largest colocation server providers that will help ensure uptime and redundancy. HP Rootserver: Choose from a number of high-performance kits based off of HP Proliant DL server hardware. Hosting services: Nessus provides a number of premium support services to help manage or improve your server’s performance. Fully-managed VPS: VPS plans come fully-managed by trained technicians. You will need some know-how to run a Nessus web server unless you want to rely heavily on purchasing support services. You get a running server to do with as you please. The signup is quick and painless, but the whole experience is less guided than with some other web hosting providers. Nessus products are divided into either web hosting server products or purchasing server space within one of their data centers. All products are offered on a monthly basis but there are no free trial periods. 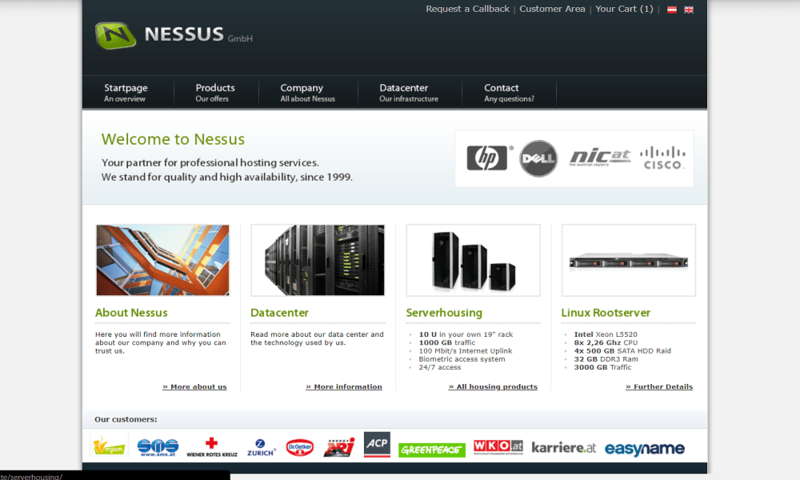 Standard Server Housing: You can purchase server space in Nessus’ own data center in Vienna. You can choose from five options based on the resources, processing power, and kWh you require or use. Interxion Server Housing: The options are very similar but are slightly more expensive. Your server will be housed in a colocated Interxion server. HP Rootserver: These servers run on the latest HP server boxes. There are three options with varying amounts of RAM, data transfer limits, and storage. This is the most expensive category of server hosting. As their main client base is businesses with high availability and performance requirements, all products come with 24/7 monitoring and technical support. They offer a number of other premium support servers like monitoring the health of your server, a readiness team, and server management. Email and phone support are available. If you’re looking for server space with superb availability, performance, and redundancy with minimal hand-holding, then Nessus is a great option, particularly if you’re located or want to serve data within Europe. Wondering how Nessus stacks up against other Web Hosting companies? Enter any other Web Hosting company and we will give you a side-by-side comparison.